Onion and garlic are some of the most effective organic insecticides. They can be used in many ways to combat harmful insects that attack your plants. Don’t forget! Before applying any treatment against the pests, analyze the plant carefully. If you keep the pots outdoors, never, but never, apply organic insecticides when it’s the heatwave climax. The best moment to apply the organic insecticide is in the morning and evening by respecting carefully the rules of insecticide sprinkling. Fill the jar with water, and then chop the onion finely to extract its active substances. Place the minced onion in the jar and let it to macerate for 24 hours to a 68-73.4 degrees F.
After 24 hours, strain the onion water, pour it in a sprayer and spray over the plants with it. The onion macerate is one of the best fungicide and a great repellent. Crush the garlic cloves and let them soak for 24 hours in the olive oil amount. After the time passes, strain the liquid and squeeze well the garlic pulp to release all its active substances. Now, over the garlic oil, add 1 teaspoon of liquid soap, mix it well, and then add 1 liter of water. Let this mixture to preserve in cold and dark places for about 3 weeks. 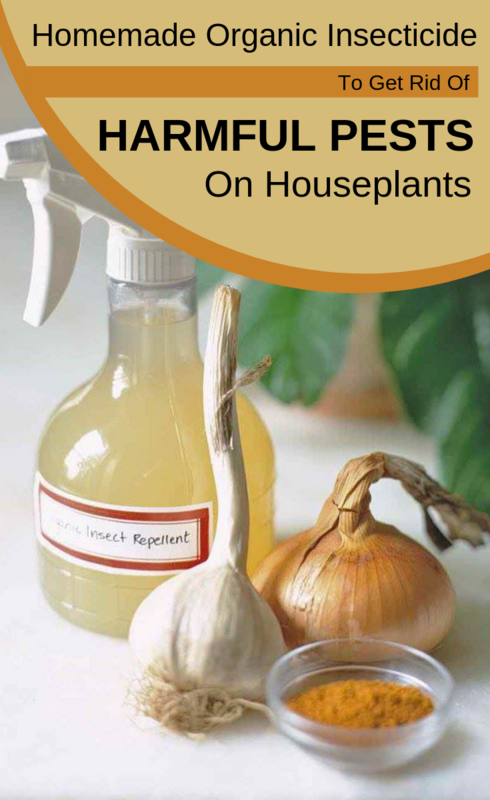 To spray the plants, make a solution of 1-part of garlic emulsion and 20 parts of water. It’s a very good insecticide or repellent against aphids and mites. It’s also used successfully against rust, Botrytis and Taphrina.